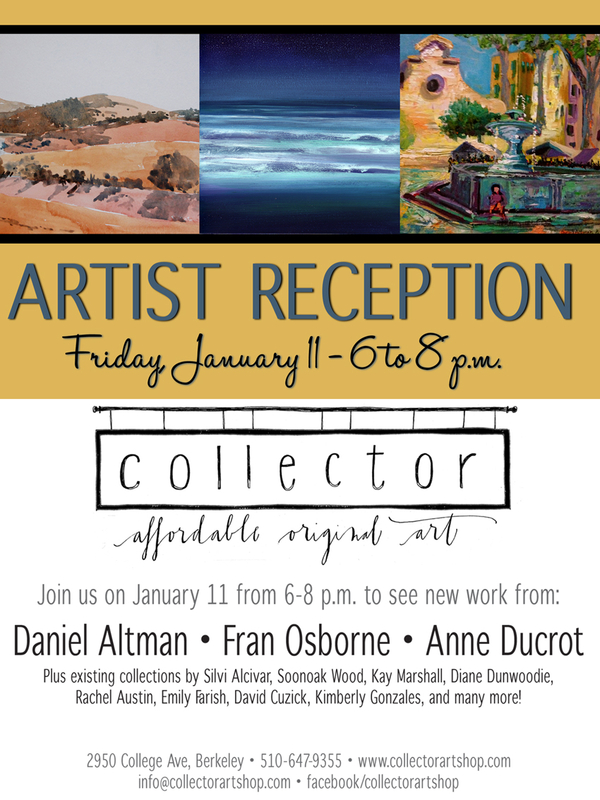 Very happy to be starting the year off with a small show at Collector, 2950 College Avenue, Berkeley CA 94705, which opens on Friday January 11th 6-8pm. Collector shows affordable art by local artists, and has become part of the fabric of Elmwood. According to my sources, they don’t mind if you take in an ice-cream from posh ice-cream parlor ici, next door, as you browse and absorb. I love the fact that they chose the ‘Hills Around Port Costa’ for the postcard because I blogged about it in September and loved how that painting happened. Here’s the post if you want to know more https://franwork.wordpress.com/2012/09/08/hills-around-port-costa/. Awesome – I’ll be there.